Students from the Nacogdoches Independent School District participated in the fourth Barrio Writers summer program at Stephen F. Austin State University. Dr. Heather Olson Beal, SFA associate professor in the Department of Secondary Education and Educational Leadership, serves as the coordinator for this free weeklong program, which promotes literature and creative writing to teens. 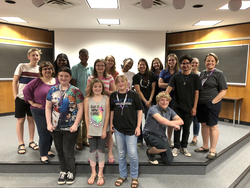 NACOGDOCHES, Texas - Literature was the name of the game last week as students from the Nacogdoches Independent School District participated in the fourth Barrio Writers summer program at Stephen F. Austin State University. Dr. Heather Olson Beal, SFA associate professor in the Department of Secondary Education and Educational Leadership, serves as the coordinator for this free weeklong program. "We read beautiful and powerful literature written by famous and less-famous writers of color," Beal said. "We had awesome conversations and dialogue with the youth who left the writing advisors feeling so good about our future." Barrio Writers is tailored for students ages 13 through 21 with an interest in reading and writing. Through this program, participants engage in workshops led by SFA students, faculty and staff. Participants read books, poems and song lyrics before discussing them as a group and free writing. SFA faculty and staff who led the workshops and served as writing advisors included Beal; Dr. Lauren Burrow, associate professor of elementary education; Dr. Chrissy Cross, assistant professor of secondary education and educational leadership; Alicia De La Rosa-Millard, secretary in SFA's Office of Multicultural Affairs; and Dr. Amber Wagnon, lecturer in the Department of English and Creative Writing. Adaeze Elechi, an SFA student and poet, served as a guest artist and shared a spoken word piece. At the end of the week, students hosted a live reading with the community to share their works. "Barrio Writers is so important for supporting our youth in the community who are interested in creative writing and whose voices I believe we all need to hear," Beal said. Each year, participants also attend a field trip in the community. Jeff Brewer, assistant professor in the School of Art, gave the students a tour of the SFA Sculpture for All exhibit in the SFA Arboretum. Each student had a piece published in the 10th edition of the Barrio Writers anthology, which has been published by the SFA Press for the past few years. The 8th edition is available for $20 at the Bosslight in downtown Nacogdoches. The 9th and 10th editions are forthcoming. To learn more about this program, visit barriowriters.org, or email sfabarriowrtiers@gmail.com.